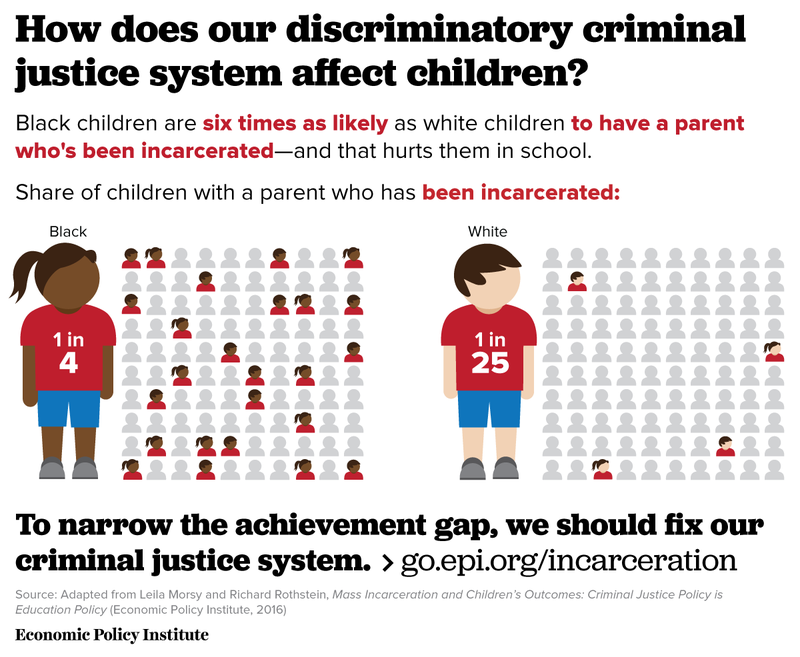 On any school day, one in ten African American children has a parent behind bars; African American children are six times as likely as white children to have had an imprisoned parent. Although young African American men are no more likely to use or sell drugs than young white men, young African American men are nearly three times as likely as white men to be arrested for drug use or sale; once arrested, they are more likely to be sentenced; and once sentenced, their jail or prison terms are typically 50 percent longer. The discriminatory incarceration of African American parents, fathers especially, lowers their children’s performance. We can reasonably infer that our criminal justice system contributes to the black-white achievement gap in both cognitive and non-cognitive skills. Children with parents who have been imprisoned are more likely to drop out. They tend to have worse GPAs. Their behavior deteriorates and they are more likely to be suspended or expelled. They are more likely to develop learning disabilities. Their mental health suffers—their anxiety tends to increase, as does their depression. They are more likely to face physical health problems like asthma, high cholesterol, and migraines. It may be tempting to think that these conditions simply reflect children’s socio-economic backgrounds; however, the statistical sophistication of studies we’ve reviewed all but eliminates the plausibility that these depressed outcomes substantially result from anything other than parental incarceration. Many more children are harmed by parental incarceration in state than in federal prisons. In 2014, over 700,000 prisoners nationwide were serving sentences of a year or longer for non-violent crimes. Over 600,000 of these were in state, not federal prisons. Educators can press for change in state and local policing and criminal justice policies that will benefit their students. For more, read our report, Mass incarceration and children’s outcomes: Criminal justice policy is education policy.